Purulent tonsillitis of throat is a very common infection in children up to the age of three, but it does not bypass the adults. For tonsillitis in adults and children to be prevented most important is strong immunity and good hand hygiene, if the inflammation does occur, it is important to consistency apply the therapy. Big help in the prevention and reduction of symptoms have herbs. Tonsils are egg-shaped glands located on either side of the throat, which plays a significant role in defending the body against various diseases. They are part of the immune and lymphatic system, and their task is to prevent the body to penetrate the bacteria and viruses that causes disease. Because of this role, they act like a sponge that collects dirt, in people with less developed resistance or with the significant drop of immunity that frequently succumb to the onslaught of germs, and inflammation occurs. Tonsillitis or purulent tonsillitis of throat, is one of the most common diseases in children and is among the main reasons for visiting the doctor. If the disease assumes a chronic form, and prevents the tonsils to properly perform its function (and bring more harm than good) – tonsillectomy is then applied where they are removed by surgery. The most common cause of inflammation of the tonsils are viruses, but it can be a kind of bacteria. Purulent tonsillitis can be observed with the naked eye: the tonsils are red and enlarged, covered with yellowish mucus or purulent white patches. 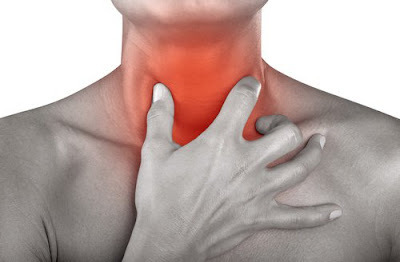 The symptoms of throat angina are: throat pain when swallowing, hoarseness, a disease accompanied by fever, general malaise, fatigue, muscle pain, swelling and numbness of the lymph nodes in the neck. With the bacterium, extremely bad breath may occur, while the younger children often complain of pain in the head and stomach. Sometimes it occurs in severe cases, requiring urgent addressing the doctor, especially if you have difficulty swallowing where breathing becomes much more difficult. Also, in case of extreme fatigue and hypersensitivity, essential is medical intervention. Tonsillitis can be caused by several types of bacteria, such as streptococci (creating a so-called strep throat, angina of the throat may cause complications in the form of rheumatic fever, or heart failure), staphylococci, pneumococci, and some fungi. To this disease most susceptible are children under three years, because they still do not have fully developed immune system, and pre-schoolers and school-age children are affected, since they live in areas that are exposed to microbes (kindergartens, schools). Purulent angina can be recognized by white dots on tonsils. In some types spots are located in the crypts of the tonsils, and their environment is under inflammation. Often it happens that untreated flu in an ear infection, because the Eustachian tube, duct that connects the nose and ear, is short and at a different angle than in adults, and the inflammation spreads more easily. Also, the throat can be affected and the inflammation of the upper airways may occur. The doctor will then check the swollen glands in the neck and look for a rash, known as scarlet fever, which is associated with the appearance of "strep throat". After that the doctor will feel the abdomen to see if the enlarged spleen, is indicating mononucleosis, which is also one of the causes of an infection of the tonsils. Although it is much more common among children which often teams up with an ear infection and inflammation of the upper respiratory tract, tonsillitis are quite common in adults especially in those where there is a decline of immunity. If you suspect that the inflammation is caused by bacteria, the doctor will submit the analysis of a swab of throat, whose results are usually ready in 24 to 48 hours. It is necessary to do a complete blood count (CBC), based on the findings which easily can determine whether it is a viral or bacterial inflammation. When it comes to purulent tonsillitis of the throat antibiotic are used in the treatment. The most common causes are adenovirus and this form is most prevalent among the population. Characteristic for it is the bright-red throat and the doctor then overwrites only painkillers and antiseptic. In this case, treatment of throat lasts seven to ten days, and the patient for the time has to rest and take as much liquid as possible, which will prevent drying and irritation of the throat. If the bacterium is the cause, otolaryngologist will prescribe antibiotics, usually penicillin, which successfully treats angina caused by Streptococcus type A. Depending on whether it comes to purulent tonsillitis without fever or with it, only a doctor can prescribe and dispense the appropriate medication. It is extremely important that patients continue taking the therapy even if improvement occurs, until disappearance of symptoms. This will prevent the recurrence of the disease, which in this case occurs in more severe cases because discontinuation creates drug resistance. Use of drugs on your own, particularly antibiotics is not recommended because only doctor on the basis of review and analysis can determine the day if it comes to purulent tonsillitis of the throat. If it is a viral sore throat, antibiotics will not be of any help, but will affect the flora in the stomach, which can cause a number of problems (diarrhoea, digestive disorders due to the destruction of good bacteria, fungal infections) as well as reduced sensitivity to these medication. If, however, there is a bacterial infection, the laity cannot determine the appropriate antibiotic, nor can they assess the necessary dose. As the microbes are the main causes of throat diseases, hygiene is the best prevention: regular, proper and thorough hand washing before and after meals. Also, proper nutrition and optimal consumption of fluids and vitamins is important for strengthening the immune system, which in this case is easier to deal with viruses and bacteria. In terms of tonsillitis in school children, and if the disease does not spread, sick children should not be sent among other people. Already at the first sign of angina it is best to put around the neck hot compresses and recommended is rest and lying in bed. For wraps around the neck the best practice is sage tea, clay and vinegar, wrap around the chest lavender, eucalyptus oil, and use foot baths. At night it is recommended that in the wool sock you put cooked and mashed potatoes (with skin) and wrap with a scarf-this is a known folk remedy for sore throat. Gargle of the throat is best with chamomile tea, mint and sage. Saline solution can be used as well. Massage the neck with eucalyptus oil and drink more fluids every day. Use propolis drops, try to find sweets with sage. Do not eat a lot of dairy products, if purulent tonsillitis are in their severe form, it is important to eat soft mushy and fibrous food. When asked how purulent tonsillitis is treated, answers can be found in the Russian traditional medicine. You need beet (the bigger the better) and 9% alcohol vinegar. Grate the beet and add a tablespoon of vinegar. The proportion of 250 grams of beetroot = 1 tablespoon vinegar. Stir well and let it stand for 20 minutes. Strain the drink through a plastic strainer or through cheesecloth. Drink beet juice and use it to rinse the throat, and this is done every two to three hours and if you swallow the juice that is even better, since you will act preventively against upper respiratory tract infections.